From this video, skip the command line field. Not necessary anymore. When you press Connect(red arrow on image) then the screen will “blacked out” and a spin wheel will show for one minute or less. 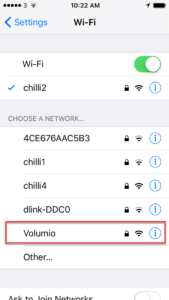 Wait and after that your Raspberry Pi will be connected to your WiFi router. The UI can be accessed from any device with a browser: Tablets, PC, Mac, Android Phones, iPhones, Smart TVs, Ebook readers etc. Make sure you have the latest versions of their respective browsers. For an optimal experience, Google Chrome is suggested. 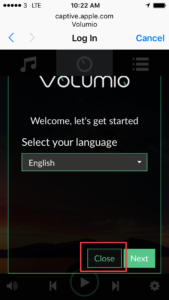 Volumio UI can also be accessed by typing http://volumio.local, or if you renamed your Volumio device http://VOLUMIONAME.local . 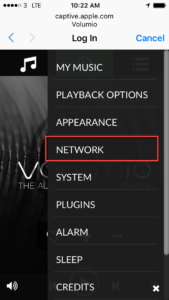 Click on Save and restart your Media Player. PrevPrevious3R USB Renaissance among the top-5 products of the year!